Tired of giving your dog the same old boring biscuits day after day? Just like humans, dogs enjoy variety when it comes to snacking, and are more likely to achieve success in training and obedience if they can’t get enough of the treats you’re handing out for good behavior. We’ve compiled a list of some of the most interesting and imaginative dog biscuits on the market to give you ideas for what to look for when rewarding your furry companion. If your dog’s standard treats have lost their appeal, or if you just want to give your four-legged friend something special to show how much you care, you’ll want to know all about these unique dog biscuits that are anything but basic. 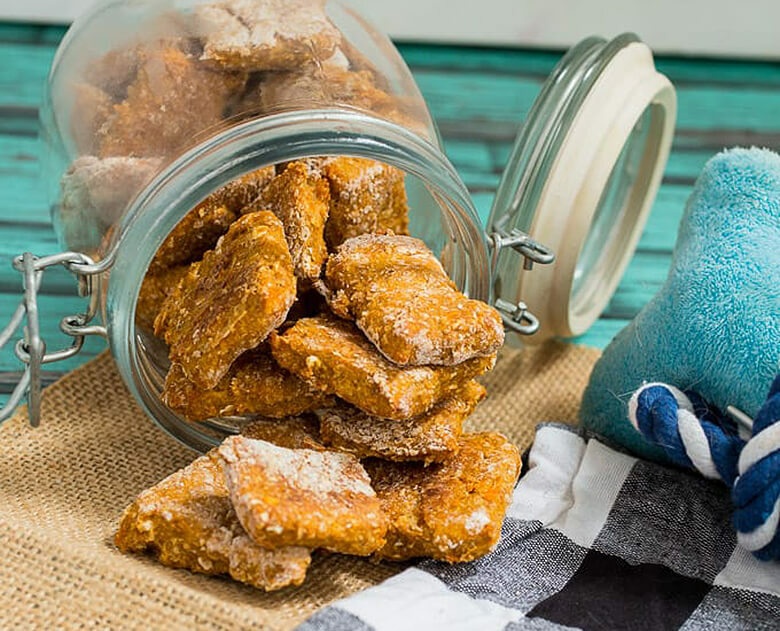 You may not be able to bring your pup to the movie theater with you, but you can treat him with a popcorn-inspired treat made just for dogs! This outside-the-box treat contains highly beneficial probiotics and prebiotics so you can be sure your furry BFF is snacking healthy. We love PupCorn Plus Cheddar & Parmesan Flavored Dog Treats, available online. By now, you’ve probably heard about the many health benefits you can enjoy from a healthy dose of hemp seed oil in your diet. But did you know that hemp can also help our canine counterparts achieve a longer, healthier life? Hemp-infused dog biscuits from companies like the Colorado-based HempMy Pet bake delicious gourmet treats in small batches for your pup to enjoy. Not only do HempMy Pet treats contain hemp seed oil, which may go a long way toward helping decrease symptoms of arthritis and improve joint health in dogs as they age, but it also includes a list of healthy, non-GMO ingredients, such as sweet potato and apple, that your pets love! Best of all, hemp-infused dog biscuits don’t contain any THC (the active ingredient in marijuana) so there’s no risk of accidentally getting Fido high- it’s a win-win! Your dog is anything but average- why feed her average dog biscuits? Next time you purchase dog treats, make it a point to get healthy, interesting snacks that are every bit as unique as the dog that’s enjoying them.